Local producer Scatterbrain has been putting in the work recently. His most recent album, YOUNGA$$$CATTERBRAIN, a collaboration with local hip-hop crew Swell Merchants’ YOUNGA$$ NICO, came out on April 20 and showcased this young musician’s strength as a producer. Alleviation is a long, 16-track beat tape that is a work of passion and dedication. 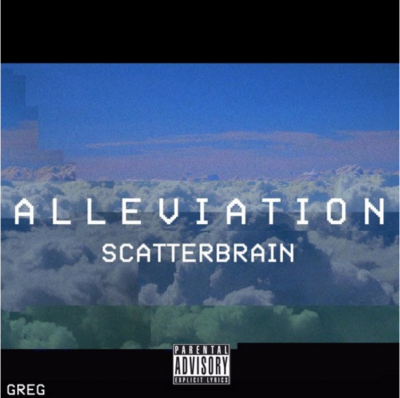 According to his SoundCloud, Scatterbrain is using Alleviation to tell a story of the ups and downs of his life and some struggles he has been going through. Even though this tape is just instrumental, it is emotionally charged and real, showing that a lot of hard work and love went into its creation. Alleviation sports styles that are varied, and Scatterbrain covers a wide spectrum of themes and eras in his work. Tracks like “philthrum” sound like old-school MF Doom beats, sporting lo-fi bass and disco-style retro samples. Tracks like “positive thuggin,” on the other hand, are modern, and Scatterbrain uses subby bass-lines and trap-style hi-hats with ease. Some songs end abruptly and sound unfinished, but not in a bad way. They leave the listener wanting more and wondering where the track was going to go if it did not cut out abruptly. Though most songs on Alleviation are without vocals, there are a few that feature lyrics from well-known artists. “Thank You Gucci” is a down-tempo, powerful remix of Gucci Mane’s “Freaky Gurl” and is a fantastic ode to one of trap music’s renowned artists. The song “You” is an ode to 2Pac, but also combines an eerie vocal sample throughout. Though they are few, the remixes on Alleviation exhibit Scatterbrain’s ability to carry rap lyrics through a song, and are wonderful reprises of tracks that diehard rap fans are guaranteed to know.